The verification of access controls is essential for providing secure systems. Model checking is an automated technique used for verifying finite state machines. The properties to be verified are usually expressed as formula in temporal logic. 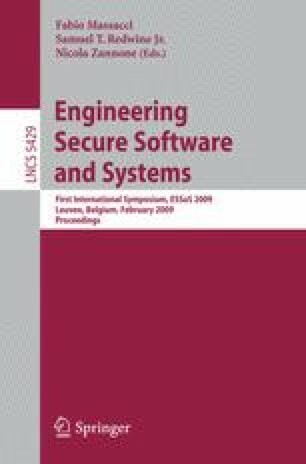 In this paper we present an approach to verify access control security properties of a security annotated business process model. To this end we utilise a security enhanced BPMN notation to define access control properties. To enhance the usability the complex and technical details are hidden from the process modeller by using an automatic translation of the process model into a process meta language (Promela) based on Coloured Petri net (CPN) semantics. The model checker SPIN is used for the process model verification and a trace file is written to provide visual feedback to the modeller on the abstraction level of the verified process model. As a proof of concept the described translation methodology is implemented as a plug-in for the free web-based BPMN modelling tool Oryx.